Sony Ericsson's first Android-based smartphone, the Xperia X10, comes with a unique user interface that's designed to improve handling and organization of communications and multimedia content. But one analyst said the interface still needs work, particularly when it comes to speed and responsiveness, before the phone hits the market. The X10 will be the flagship model in a family of phones coming to market during the first half of next year, Sony Ericsson said, without providing details of other models in the lineup. The X10 will start shipping in the first quarter next year in Europe and Asia, according to Sony Ericsson. Asia includes Japan were it previously has sold local products. Plans for the U.S are still up in the air, but the company is in discussions with U.S operators, it said. As part of the X10's interface, Sony Ericsson added two applications, dubbed Timescape and Mediascape, to Android, following in the footsteps of Motorola, HTC and Acer, which have also tweaked the operating system for their own handsets. These modifications may prove to be important. Apple's iPhone has shown that winning in the smartphone space is about ease-of-use and not hardware specifications, like offering the biggest display or the best camera. Sony Ericsson hopes that helping users better organize messages and multimedia will help it stand out from other Android handsets. Its Timescape application organizes messages, such as Twitter posts and Facebook updates as well as phone calls and SMS messages, in a number of different views. For example, users can choose to view all messages in chronological order, or view them by user or message type, such as all Twitter posts. The Mediascape application helps users arrange their multimedia content, including music and videos. 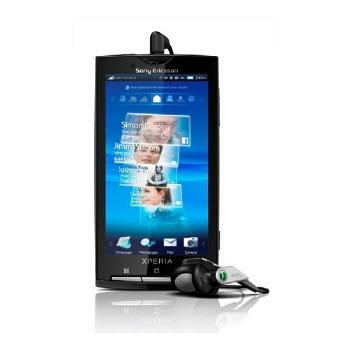 The application also gives users access to Web-based content, including YouTube and Sony Ericsson's Playnow store. The new user interface may be a key part of Sony Ericsson's Android strategy, but the interface still needs work, according to Carolina Milanesi, a research director at Gartner. Right now, the user interface isn't as snappy as it should be, Milanesi said. But the device is still in development and the interface can still be improved she said, adding that a final verdict will have to wait until the phone ships. In many respects the X10 is a "me too" device, given that most handset makers are touting the integration of social networking as a key features of their handsets, Milanesi said. But it also shows that Sony Ericsson can get its act together and do something different from the Walkman and Cybershot phones of the past, she said. Overall, the X10 and its user interface represents a new start for Sony Ericsson, and one the Milanesi thinks should come with a new brand. It's a bit of a shame that Sony Ericsson went with the Xperia brand because the X1 wasn't that well received, she said. While hardware specifications may not be critical to a phone's success, the X10 offers a range of cutting-edge features. For example, the X10 has a facial recognition features that can recognize up to five faces in any picture, automatically connecting them with friends listed in your address book and of your communications with that person. There is no doubt that Sony Ericsson has had the iPhone on its mind when designing the X10, which will also be available in either black or white and lacks a physical keyboard. The two phones weigh the same, but the X10 is slightly larger. In terms of memory, the iPhone has a larger built-in storage capacity; 32GB versus 1GB. But the Sony Ericsson phone comes with a microSD card slot and ships with a 8GB card. In most other respects the X10's hardware specifications surpass those of the iPhone and other Android handsets, including the Acer Liquid and Motorola Droid, which will be called Milestone outside of the U.S. The X10 has the largest screen and the camera with the highest resolution. The 4-inch capacitive touchscreen display has a resolution of 854 pixels by 480 pixels. Cameras have for some time been one of Sony Ericsson's major strengths, and the X10 has been equipped with an 8.1-megapixel camera and a LED flash. Added camera features include touch focus, geotagging and smile detection. X10 users can surf the web over HSPA (High-Speed Packet Access) or Wi-Fi networks. They can also listen to music via a standard 3.5 millimeter stereo headphone jack or navigate using A-GPS (Assisted-GPS). The phone has a 1 GHz Qualcomm Snapdragon processor under the hood. On the software side, the X10 will ship with Android version 1.6 but users will be able to upgrade to version 2.